Corn, Beans, Pigs and Kids: What kind of grocery shopper are you? What kind of grocery shopper are you? When you enter the grocery store, what are you concerned about? Brand names? Nutrition? Taste? Price? There are many factors that probably go into making your decisions. We all probably have some different priorities, but that is what is great about living where we do, we get to make our own food choices. The Iowa Farm Bureau Food and Farm Index just released their survey results as part of a semi-annual series. The first part of the survey looked at the many factors driving the food purchases of Iowans. 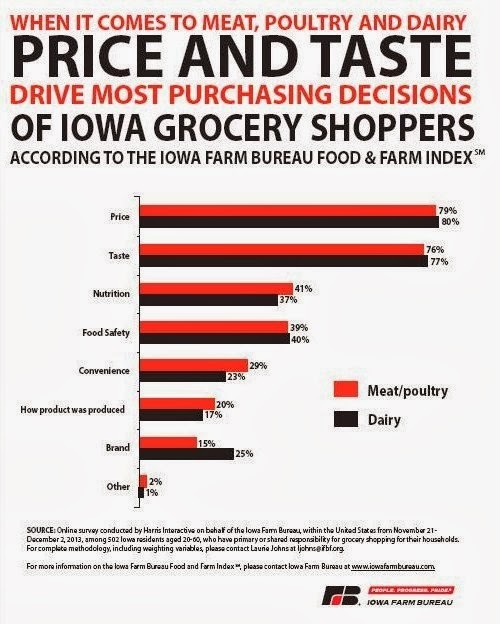 The survey asked participants, Iowa residents ages 20 to 60, which three factors are most important to them when they determine which meat, poultry and dairy products to purchase. For me the top factor is price. I'm always trying to get the best deal; I use the sales ad when creating my shopping list and use coupons to compliment my list. The second factor would be taste. I only buy food that tastes good to me, which I think would be the same for everyone. I do like to experiment with new recipes and food, but if the recipe doesn't get family approval, I cut my losses and throw it away. In the era of Pinterest and the Food Network I can always find new things to try. The third factor for me would probably be nutrition. When it comes to meat, poultry and dairy I like to go for lean cuts and low-fat options. So what do the survey results tell me? Well first, it looks like I am an average Iowan. Second, I see by far, price and taste are the top factors influencing purchasing decisions. Nearly 8 out of every 10 participants marked price and taste. Third, it looks like the next set of popular influencers were food safety and nutrition. I think these are both "hot topic" areas of discussion and a place where I think most shoppers are looking for more information on and where I, as a farmer, need to not only be educated myself, but willing to share what I do to provide nutritious and responsible food choices. The last interesting thing I noticed was convenience was one of the bottom factors. I feel like many people are trying and wanting to "get back to their roots" and do more homemade things, and food/meals is an easy way of doing that. I personally love making meals and treats from scratch for my family. Be sure to Comment for a Cause! Great post Val! I think I would rank fairly close to average as well with price as #1, nutrition at #2 and taste at #3. If locally produced was a category that would rank high for me as well. I always try and support local livestock and vegetable growers in the area as much as possible. I'd love to see how Iowa compares to other states like Illinois and New York with larger metro areas. Do any of the other state Farm Bureaus conduct this survey? That would be interesting. I am not sure if this survey is done in other areas. i will ask! Laura, I checked with the Iowa Farm Bureau and this survey and questions are uniquely Iowa's. They worked directly with Harris Interactive to build the list of questions, target audience, etc. Thanks Zach! 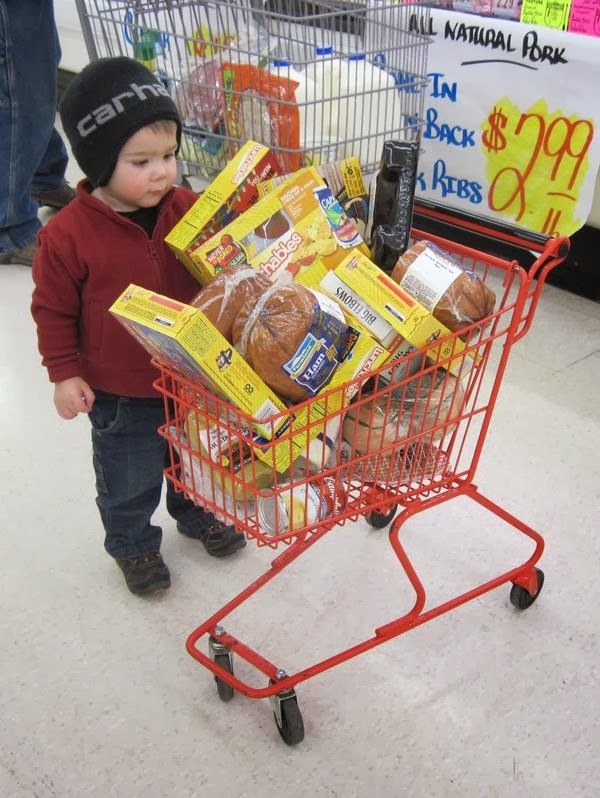 He does do a good job of getting as much as possible in his cart! Great job, Val. Better get LP a bigger cart! While price is a very important factor for me, I am willing to pay more for a quality product. That doesn't mean that everything I buy is a brand name, in fact my cart is usually filled with generic staples. It is important to me to have good meat and produce. I could care less what kind of cracker or sugar is in my basket. I also like to purchase local produce if possible and meat and dairy products from companies that I know support the independent farmer. I wonder if they would have gave the option of local where that would have charted? And I guess for me quality probably would fall under taste. I have stopped buying a certain brand of pasta for example because no matter how early you stop cooking the noodles they always come out overdone. I love those little grocery carts. For me price depends. Like if it's produce, I'll pay more for organic or local if it's not horribly expensive, but I buy store brand products for many things too like cheese or canned soup. The next survey they are going to do is regarding produce so it'll be interesting if the results come out differently, like you expressed with your shopping preferences. I'm on a nutrition kick lately so my no. 3 factors would be taste, convenience and nutrition. I do not cook or bake so it must be easy. I doubt if I'd EVER make anything from scratch and can't imagine anyone actually liking to do that, but have a friend who likes to. It just seems like unnecessary work to me. My husband and I were talking about the convenience factor last night and we decided his top factor is convenience when he is grocery shopping. We laughed because I do not like to have frozen dinners or boxed mixes in the house - I'd rather make everything from scratch. On the other hand, if he is incharge of supper, he goes straight to the frozen pizza instead of making homemade like I do, or goes from the box of Hamburger Helper rather than me making homemade macaroni and cheese with hamburger. I know the convenience food market is huge. The meat industry has spend a lot of time on research and development so there are tons of frozen, deli, etc. meat choices. I'd say my top two are price and taste. While I do buy generic and store brands of many items, I'm willing to pay more for brands such as AE (milk, cottage cheese, etc). I agree. No one out there doesn't want to put quality products in their grocery cart. Interesting survey; I'm guessing I fall in the 1% "other" category, haha. For me, animal health and ethics are my number one purchasing decision, followed by food safety, nutrition, then convenience. I'm willing to pay an arm and a leg for food that I know was raised humanely and organically (or as organically as possible) and that was grown with sustainability in mind. Farming is a noble profession (total respect- I was raised on an Iowa farm) and a huge responsibility to the animals and ground farmed. As consumers I believe in paying for quality not quantity. We can't always afford to make all of our purchases that way; sometimes pricing does matter. But I truly believe in the economic vote and try to "vote" for my values with my dollars. I think you are spot on with the return to "homemade." I think people are realizing that they can save money for the little extra time it takes to prepare their own food. Also, processed foods are full of junk that I think society is finally becoming more savvy about. Such a good point about Pinterest! Maybe Pinterest is inspiring more of us to try new recipes and cook from scratch more often. I think that means you fall under the "how the product was produced" category which is about 20% it looks like. Do you think this is a growing category or a decreasing category? Wordless Wednesday - Happy Birthday My Farmer!